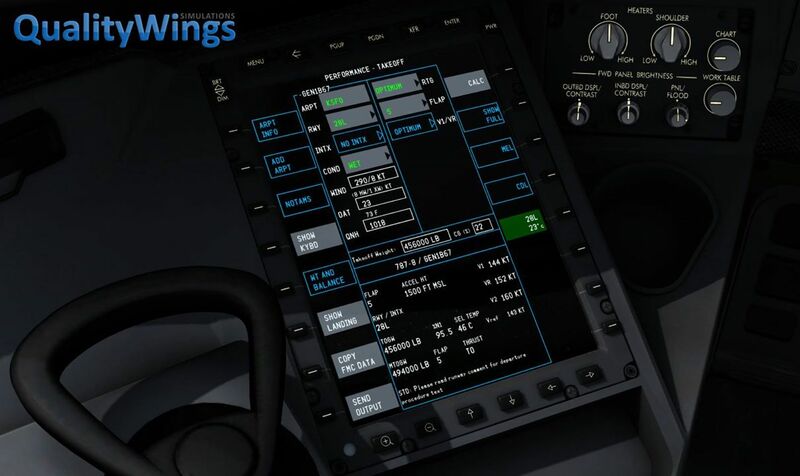 You are at:Home»Commercial»QualityWings 787 Update Released! QualityWings has today released an update for their popular Ultimate 787 aircraft addon for FSX and P3D! “As an example, the Electronic Flight Bag Dispatch page has been revisited and reworked to make its operation more intuitive and user friendly. The Take Off performance page will now also provide proper flap and derate settings. The Descent Forecast page has been added to the Flight Management System and the VC night lighting received an upgrade (P3Dv4 only). Additionally, a considerable amount of work went into improving LNAV/VNAV, performance and the product stability. The latter unfortunately is an extremely complex topic. We have been able to resolve many issues that cause CTDs (some in relation to the weather radar) but with hundreds of different hardware and software combinations being used by our customers it is a very tedious process. To further assist in troubleshooting, we have decided to implement a crash reporting module. This Installation of this module is optional. If you choose to install it and experience a CTD, you may see a popup window asking for your permission to send a crash report to us. Again, the installation of this crash reporting module is not mandatory and you will be given the option to enable it at the end of the product’s installation process. All reports are fully GDPR compliant and further information can be found here. We highly encourage every P3D user to always use our product with the latest version of P3D. We have seen nice performance improvements in P3D v4.3 and all our testing is based on that platform. Next Article Aerosoft Köln/Bonn + FSFX 747 Immersion Preview Video!